Each week we distribute 40 vegetable shares. We only offer our vegetables via the CSA, taking eggs and chickens to market. 5 weeks ago we planted our first seeds for distribution 4 weeks from now. Using Homer's Speedy Seeder, seeds for 80 heads of lettuce, 400 beets and carrots, 80 bunches of rainbow Swiss chard and spinach went in the ground inside the hoophouse. A week went by and we planted what will be harvested 5 weeks from now, and each week more beds are cleared and more goes in. In 4 weeks when the first beds are cleared tomatoes, peppers and eggplant, now growing from seed in sheltered, warm spots, will be planted. Peas and potatoes are already in the ground, as are garlic and onion and chervil. Sage too. Asparagus has not presented yet, when it does this will be the first year we harvest and distribute. Yum. 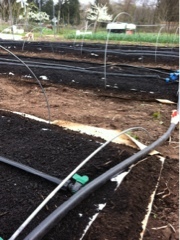 Yesterday the first beds outside the hoophouse were built and planted. 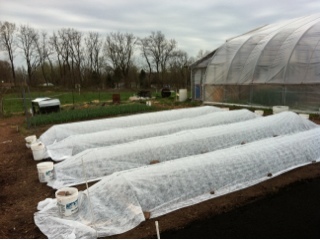 With drip tape down for water and floating row covers for protection from birds, pouring rains (that wash seeds away) and bugs that chow down on the vegetables the seeds should sprout and produce beautiful vegetables, for distribution in 8 weeks, in spite of the vagaries of weather in early spring. Shown here. With beds of garlic behind that were planted last fall.